How lethal is the .22 LR round? This video is a little long-winded, so I’ll summarize. They first shoot .22 shorts at a 1/2 inch pine board at close range. The old military standard is that if a round can cleanly penetrate the board, it’s considered potentially lethal at that distance. The .22 short — an extremely low-powered round — easily penetrates at 10′, and again at 40′. They move onto .22 LR, and end up going out to 440 yards (yes, a quarter mile). That’s far past the effective accuracy of the round. It still cleanly penetrated. I was expecting it to fall off by that distance. The best bit for me is in the last two minutes when the gentlemen are discussing the conclusions of the tests. The older fellow says that when medical care isn’t readily available: “If you get a hole in you that you weren’t born with, you’re probably going to die.” I love his delivery. This is ridiculous. I didn’t even know there was such a thing as a double barreled 1911 pistol. Is it practical? Clearly not. But here’s an older gentleman wielding two of them at once and unloading 20 .45 rounds into a metal plate in under 2 seconds. These things only cost ~$5,000. That’s a bargain! 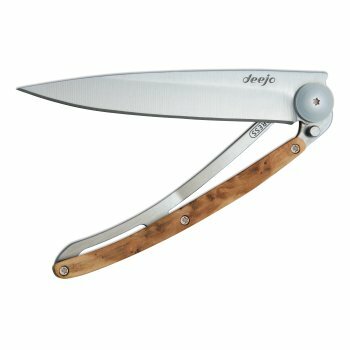 I got one of these for Christmas. It’s even more elegant in person. There are nicer guns in the world. There are more efficient ones. But something about mixing pump action with the .308 round pings my brain in a major way. Sure, you could just get a semi-auto AK variant chambered in .308 if you wanted the same durability and a greater capacity. But once again, there’s something elegant and appealing to me about this configuration. 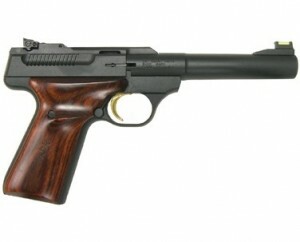 The Browning Buckmark is a great, great pistol. I had one that I purchased used years ago, then sold it. Sadly. It was a great little gun. It’s a .22, which means it’s rimfire and the ammo is cheap. This gun isn’t quite the work of art that a 1911 is, but it’s still beautiful to see and hold. Please note that I use the term “nerds” lovingly and inclusively, as a member of the group. I don’t want to get into a nerd-credentials battle, but I’m a software developer, I’ve written books on pretty niche technical topics, and I am of course currently employed at one of the greatest concentrations of professional nerd-dom to ever grace the planet. Back before the days of the Internet, if you had a disagreement about medieval weaponry, you pretty much had to agree to disagree. When I was a kid, our small town library had almost zero books descriptive of such things. And, as I’ve come to learn after writing a bunch of books, those books we did have access too were probably just written by someone who thought they knew some stuff. It was, like, just their opinion, man. Anyway, we do have the Internet now, and someone has made a handy flowchart to determine if the medieval weapon you’re wielding is a mace, a morning star, or a flail. It turns out that my friend and I who had the argument were both wrong. Click through below for the real deal and the cute flow chart. Also, if you’re even in a discussion at Google and you want to set off an hour-long verbal flame war, tell someone that you’re trying to learn to properly use a mace but the chain keeps getting kinked up, then walk quickly away. I’m intrigued by the weapons that are formed like rifles but that use ammunition that is not traditionally a rifle caliber. Here’s one example, the Kel-Tec SUB-2000. As you can see, it holds like a rifle with a grip, but it’s clearly a pistol with an elongated barrel and a stock. What’s the difference really? I’ve never shot one of these types of guns, but like I said, I find them intriguing. You can get this for $500, chambered for either 9mm or .40 S&W. Is there some kind of advantage to these beyond simple congruence of ammunition with a handgun that you already own? Is it the price? Why would you choose something like this over, say, a traditional rifle chambered in .308? Not saying they’re bad at all — just that I’m having trouble identifying the practical use case beyond matching ammo to a gun you already have. So here’s a “lightsaber” someone made. It’s really a short distance flamethrower with a tightly controlled fuel spread. But it’s still great. Click to the end where he takes it to the picture of a certain much-hated character. 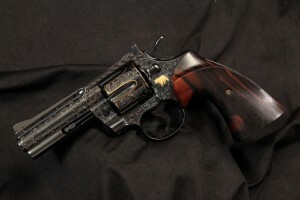 This Colt .357 Mag revolver is hand engraved and went for almost $4,000 on gunauction.com. It think it’s beautiful.